Two demonstrators were killed and at least 29 injured outside the US embassy in Tunisia, where angry crowds gathered after setting fire to the American School. 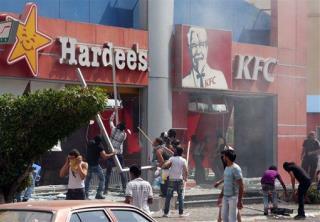 At least one person died and 25 others were hurt in the Lebanese city of Tripoli, where protesters torched and ransacked a KFC and a Hardee's restaurant, NBC News reports. Demonstrations there were timed to concur with a 3-day visit by Pope Benedict XVI, according to Lebanese officials. A protester died of birdshot wounds during a battle with police near Cairo's US embassy. He was the first Egyptian fatality during the riots. A large demonstration is underway outside the BMCI bank in Nouakchott, the capital of Mauritania, Huffington Post reports. GOOD THE MONEY SUCKING PLACES LIKE KFC HARDEES HAVE NO PLACE IN THE ISLAM CULTURE. THEY AND OTHER PLACES ARE JUST SIGNS OF GREED AND DECADENCE OF THE AMERICAN PEOPLE TO THEM! MONEY MONEY MONEY! 2 more NATO soldiers have now been shot and killed in an 'insider' attack by a man believed to be a member of the Afghan Local Police. Another service member returned fire, killing the gunman. So far this year, 47 international service members have died at the hands of Afghan soldiers or policemen or insurgents wearing their uniforms. There were at least 12 such attacks in August alone, resulting in 15 deaths.